Liquid Spirulina contains a special spirulina (blue-green aquatic plant) that has been fed a formula of special nutrients and grown in clean water that is free of contaminants such as lead, mercury and pesticides. Spirulina is one of the most concentrated natural sources of nutrition known and is the worlds's richest natural source of vitamin B-12. Spirulina contains 18 amino acids, protein, chlorophyll, Beta-carotene and its co-factors, and other natural phyto-chemicals. It is believed that, for many people, spirulina enhances thinking processes, heightens attitudes and reduces cravings for sugar and other "mood foods" The sugar in one serving of Liqua Spirulina are equivalent to the fruit sugar in an average apple. Liqua Spirulina mixes easily, tastes great, has no aftertaste, can be taken on an empty stomach and it is a great energy booster. For maximum flavour - mix with 4oz of water. Ingredients: Fructose, Deionized water, Malic acid, Natural flavours and colours. Spirulina (200mg), Xanthan, Guar and Arabic Gums. Containing less than 1/10 of 1% Potassium Sorbate and Sodium Benzoate as preservatives. The spirulina plant is up to 70% protein and is higher in protein than nearly any other food. Compare spirulina at 65%-70% versus eggs (45%), brewer's yeast (45%), soybeans (40%), dried milk (35%) and beef (17%). Spirulina is rich in vitamins and minerals and contains the entire B-complex group of vitamins. Previously substantial amounts of B-12 were thought to occur in animal sources. However spirulina contains twice the vitamin B-12 of liver. As a naturally occurring sources of B vitamins, it could replace the current need for synthetic B vitamins. The main pigment in spirulina is beta-carotene, which, when absorbed by the body, is converted to vitamin A. Two grams provide more than 100% of the RDI of vitamin A, plus calcium, iron, phosphorus, potassium, zinc and many trace elements. Liqua Spirulina is an all natural superior form of nutritional support. Re-Vita uses a proprietary manufacturing method of cold processing whereby all naturally occuring Amino Acids, Enzymes, Co-factors and Chlorophyll are preserved. Plus , unlike most plants, spirulina stores its energy as pure glycogen, which the body can instantly convert into energy for better performance and stamina. It is an excellent high energy booster for athletes, health conscious people or anyone needing an energy boost. Liqua Health is a nutrient-packed, liquid concentrate that supplies your body with over 50 essential nutrients. This long list of life-enhancement includes 18 amino acids - plus vitamins, minerals, biofl avonoids, essential fatty acids, enzymes and trace elements needed for the body to fully utilize these superior foods. Each Packet has 10 servings ie 10 sachets. We do our biznes via courier service, we can deliver to any location in Malaysia where pos laju can deliver - almost Nation Wide (Malaysia). After payment, please wechat/whatsapp or email the bank in slip. Normal questions by new customers, what if I pay and then I don't get the product, Yes it happens in many online biznes, FYI we have been doing this biznes since 2005. We are here to stay. All you have to do is join Liqua Health with a small capital. and a Biznes which you can slowly build and earn cash. 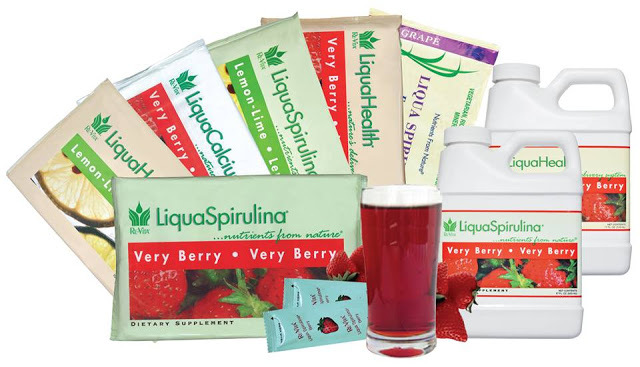 All you have to do is Introduce Liqua Health / Spirulina to your 6 family & friends. Every months your 6 family & friends purchase and consume spirulina, they become healthy and you........make some small money. This is a MLM biznes.